Li Tin Loy was born in Hong Kong in 1954. He is Hakka and a native of Ngwa county in Guangdong province. His grandfather moved to Tsok Pok Hang Village in Shatin, Hong Kong, in 1912. According to Li Tin Loy his grandfather ran a medicinal store in Sui Zai in Ng Wah county. Later a plague occurred and he brought his son Li Yong Fat and daughter-in-law to Hong Kong. Li Tin Loy has three siblings and is the second youngest in his family. 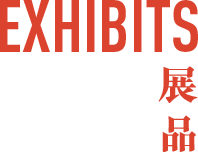 Martial arts have always been popular in the New Territories. 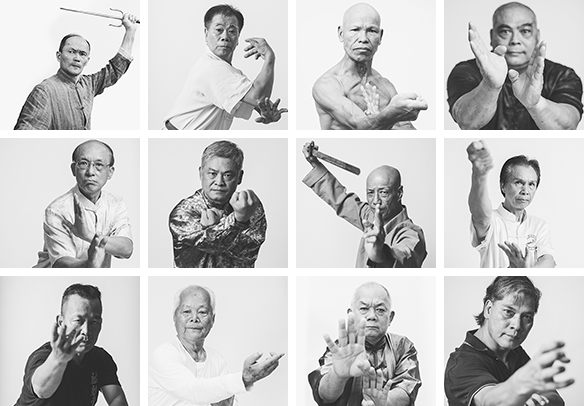 When Li Tin Loy was growing up there was a martial art master – Master Yeung – living in his village. It is said that he was the son of Master Yeung Sau, a renowned master of Tung Kong Praying Mantis style. Seeing his son was vigorous and interested in the martial arts, Li Yong Fat asked Master Yeung to take his son in as a disciple, but as the child was very young the latter declined. The next opportunity came when Li Tin Loy was sixteen years of age. He was a trainee at the marine police. In 1973, at the age of nineteen, he entered the Royal Police force (stationed at Mui Wo). In his spare time, together with a colleague from work, he went to Sai Lam Monastery at Pai Tau village in Shatin to learn Chu Gar Praying Mantis from an old man, who went by the name of Ah Wong (deceased). In the 1970s Shatin was not well developed and getting there was troublesome. Li’s companion rode to Sai Lam monastery by bike, but it was stolen after two weeks, so Li was left to practice alone. As it happened, his own study continued only for another three months as he was transferred to a different station. In 1979 at the age of twenty-four Li wished to take up kung fu again. He asked the celebrated Master Ip Shui (1912-2004), head of Tung Kong Chow Ka Preying Mantis, to take him in as a disciple. In the beginning, he studied at a rooftop martial art school in Fi Fe Street, Mongkok (Fi Fe Mansion), where a senior student of Ip Shui’s was teaching. A year later he transferred to the school run by Ng Si Kei, Ip Shui’s son-in-law. It was here he started to receive instruction from his master. Several months later he moved again to the main school in Kowloon City. As a policeman Li had a regimented schedule, which basically involved a full day of work followed by two days of holidays. When he was not at work he was in the kung fu school most of the time. Normally, he would be at a teahouse with his master at nine o’clock in the morning. At eleven they went back to the school to practice. Lunch break was at one o’clock, with a short break (nap) after lunch, and practice was resumed at three until six pm. That was his routine for ten years. 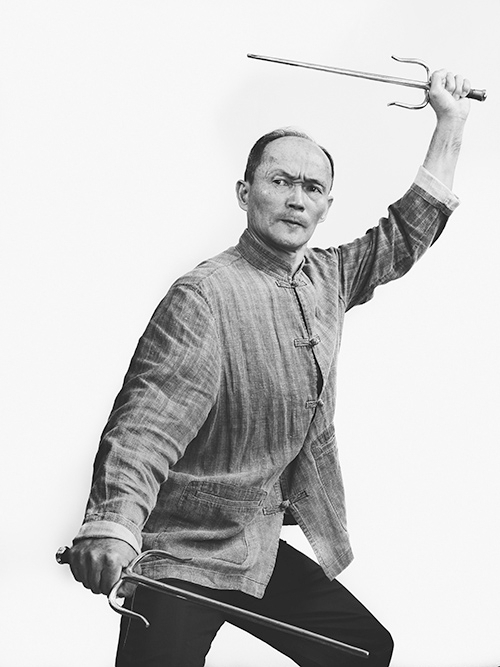 During the 1980s Li Tin Loy was already married with family but continued to practice with his master. At the same time, he started to casually teach some of his colleagues at the marine police, taking them through the same training methods he learnt from his master, such as zau maa (footwork), cai sau deui zong (basic conditioning which involves two practitioners rubbing their forearms in continuous circular motion), san sau (restricted sparring), etc. In addition, he began his own independent research on Hakka martial arts, paying frequent visits to elder masters and collecting whatever information he could find. In 1996, together with a group of colleagues who shared his interest and enthusiasm for Chinese martial arts, they started Hong Kong Police Chinese Wushu Club, and organized irregular exchanges with their counterparts in Mainland China. In 2003 he joined China Kuoshu Federation (now renamed “China Kuoshu, Dragon and Lion Dance Federation”) and was elected an executive committee member. 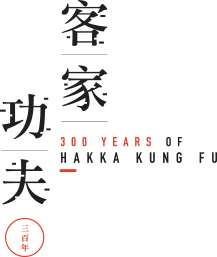 He started to give Hakka kung fu lessons at the federation and developed his own style of teaching. In 2007 Li Tin Loy retired. In the same year he founded Hong Kong Tung Kong Chow Ka Preying Mantis Li Tin Loi Martial Arts Association. He is a strict teacher and demands his students to have their feet firmly on the ground; to be truthful; to constantly seek to improve themselves; and to be devoted to studies. He frequently recites his master’s words, “To master this kung fu style the most important thing is to overcome boredom and put in hard work.” He also likes to use the following adage from Jingshi xianwen: qingfeng pian to describe his style, “treasure sword is sharpened through endless grinding, [the same way] plum blossoms acquire its scent after a bitter winter.” Li’s students often enter martial art competitions in China and overseas, frequently winning awards and accolades. In 2015 he co-founded Hakka Kung Fu Culture Research Society, for which he also serves as convener.